“Success comes through engaging people with proven processes.” Six Sigma is one such data-driven methodology that has become the way to overcome the defects of products and services. The quality control mechanism measures the unacceptable process deviations. Pioneered at Motorola by an engineer named Bill Smith, Six Sigma was initially initiated to quantify the manufacturing defects that occurred in the process, which became a huge buck saver. Later, Genpact embraced it. According to Six Sigma, anybody who wants to become a part of it can accept only three products in a million to be defective. One good thing about Six Sigma is that it allows your brain think about the endless possibilities to be competitive. Because of this, many organizations are using it for better productivity. Sounds like a great system. Doesn’t it? 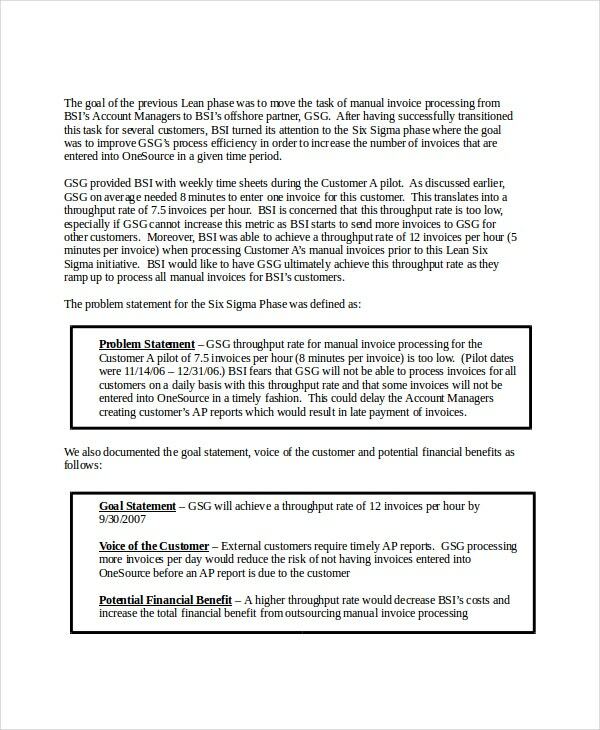 Below are some Six Sigma Example Sheet Templates for your use. 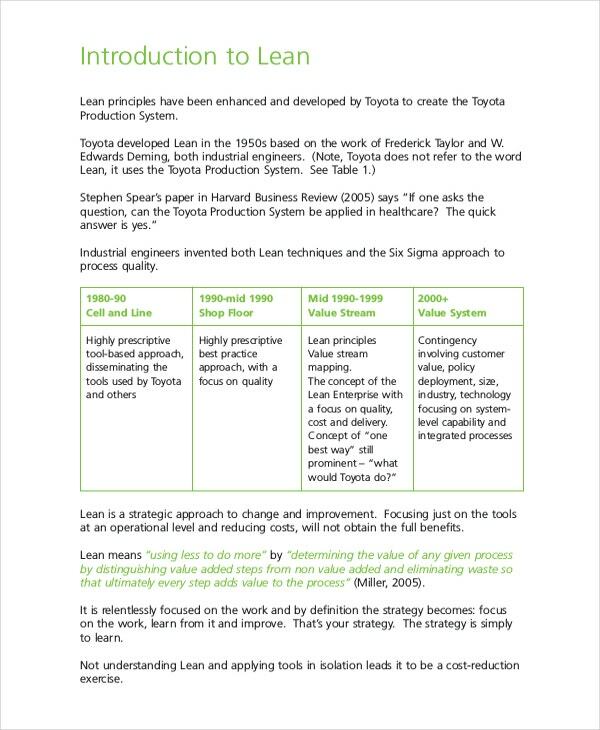 Lean is a great way to reduce costs and lead times. It’s a theology for business. This Lean Six Sigma Example helps you in getting engaged with the top to bottom of the organization. Process Maps are nothing but flow charts of a process using color-coded symbols. These Process maps play a significant role in Six Sigma Processes. Push this example for use now. There are times when you need to do things simple and smart. And especially, that is where Six Sigma works. Six Sigma speaks of complex goals approached systematically. 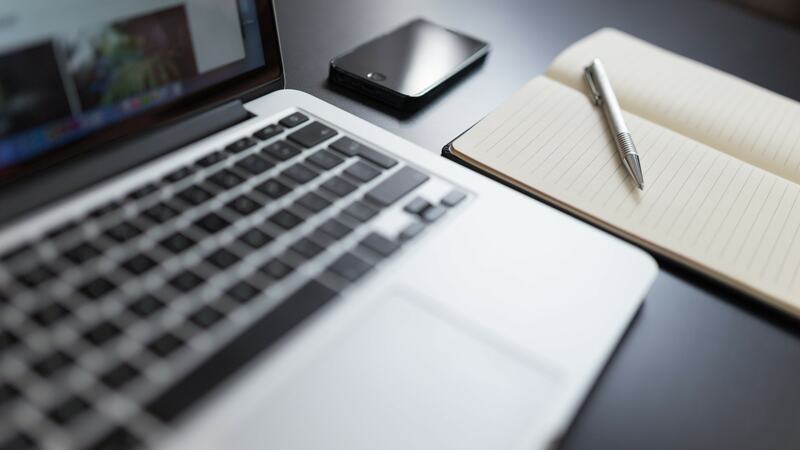 This Goal Statement Six Sigma Example helps you with a better work environment, a better production throughout, and quality. You can also see Statement Templates. A project charter is the first step in Six Sigma Methodology. 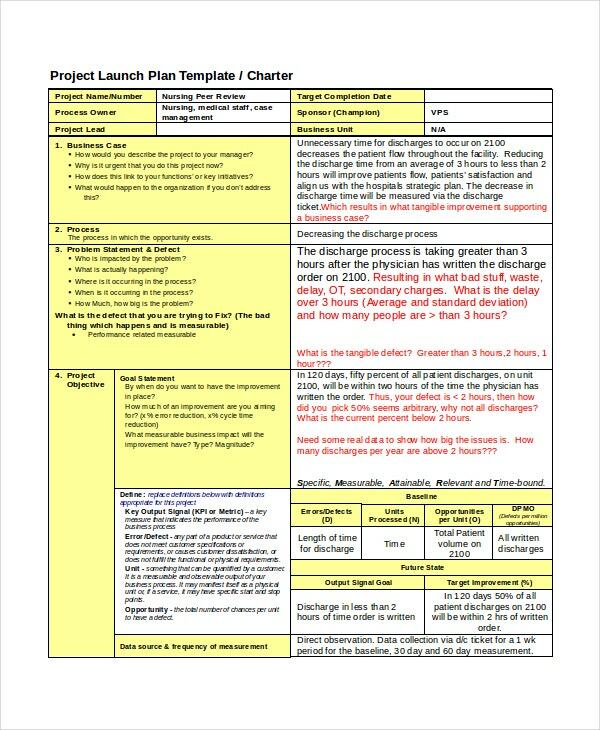 A project charter can make or break a project. 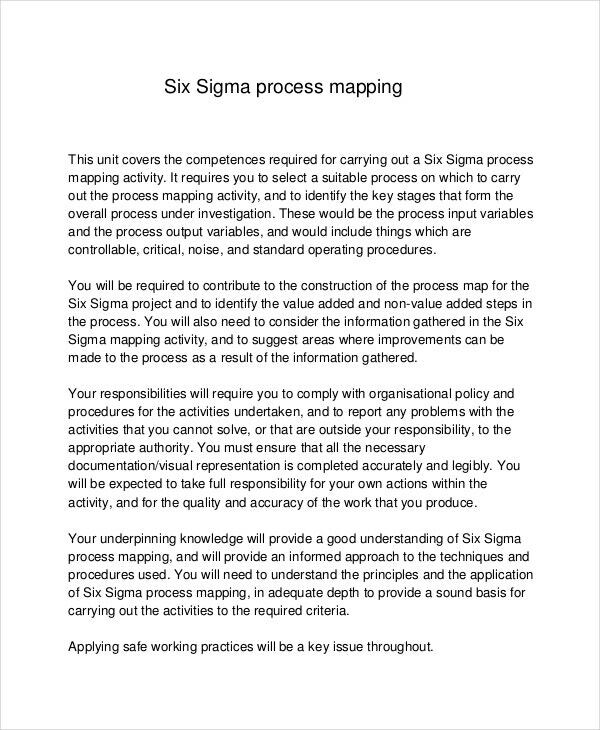 Use this Project Charter Six Sigma Example rather than gut based decisions and approaches. It’s a mistake-proof method and can be applied to almost every environment. Cause and Effect matrix helps you discover the factors that cause the debacles and act accordingly. Rather than removing people from the job, this Cause and Effect Matrix Six Sigma Example helps you see how human machine process interactions can be smoothened to achieve objectives. 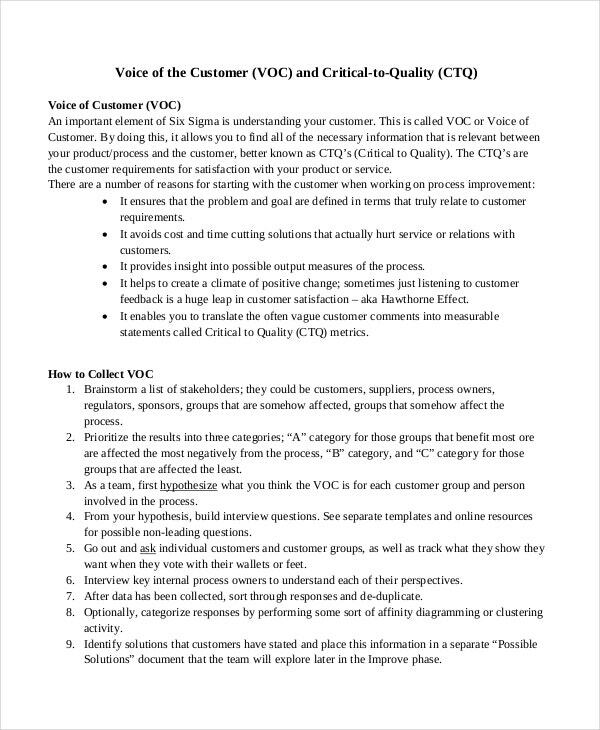 Voice of Customer is a statement that discusses the customer’s feedback, preferences, and expectations. This VOC Six Sigma Example simplifies your process by minimizing mistakes. There are several benefits of doing it. DMAIC is an acronym for five phases- Define, Measure, Analyze, Improve, and Control. DMAIC is a quality strategy for improving the processes. 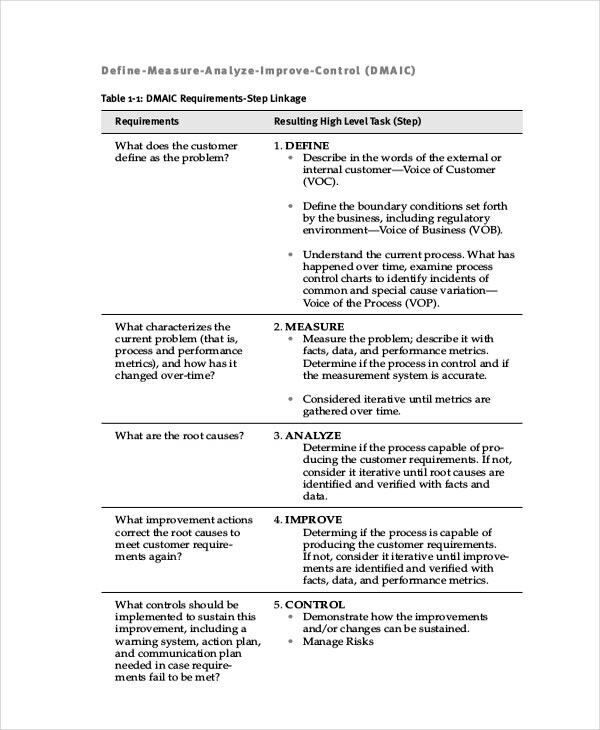 This DMAIC Six Sigma Example is a Roadmap for problem-solving and process improvement. 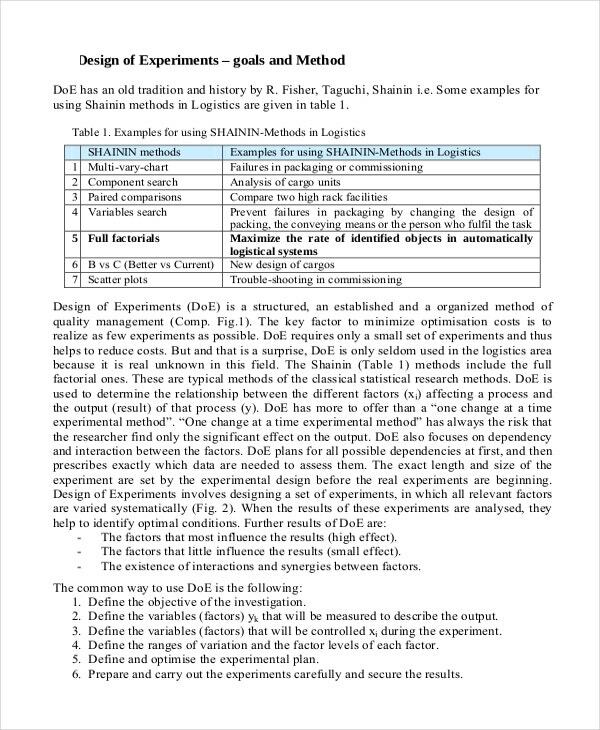 The design of Experiments (DOE) is again another structured procedure that best reduces the design costs and expedites the design process. 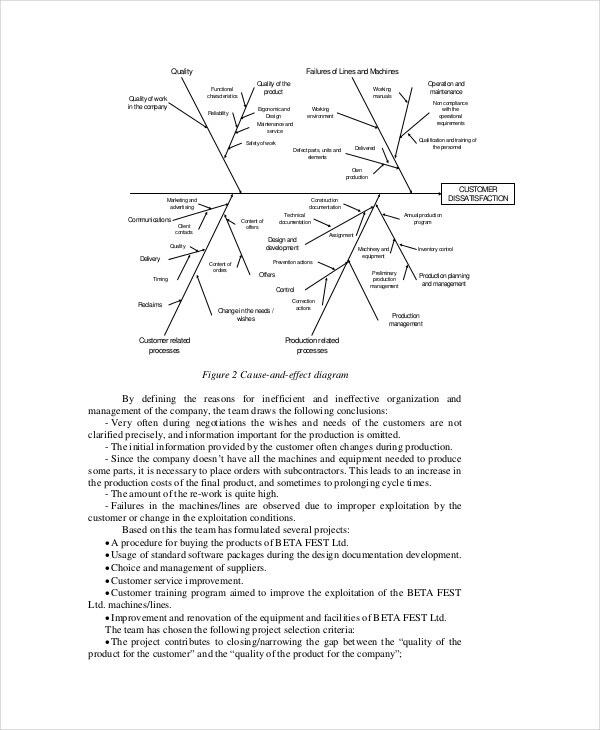 This DOE Six Sigma Example’s Six Sigma’s priority is to obtain results in a planned path. Measurement System Analysis (MSA) evaluates a measurement system by assessing its stability and accuracy through various parameters such as reproducibility, repeatability, stability, linearity, and bias. 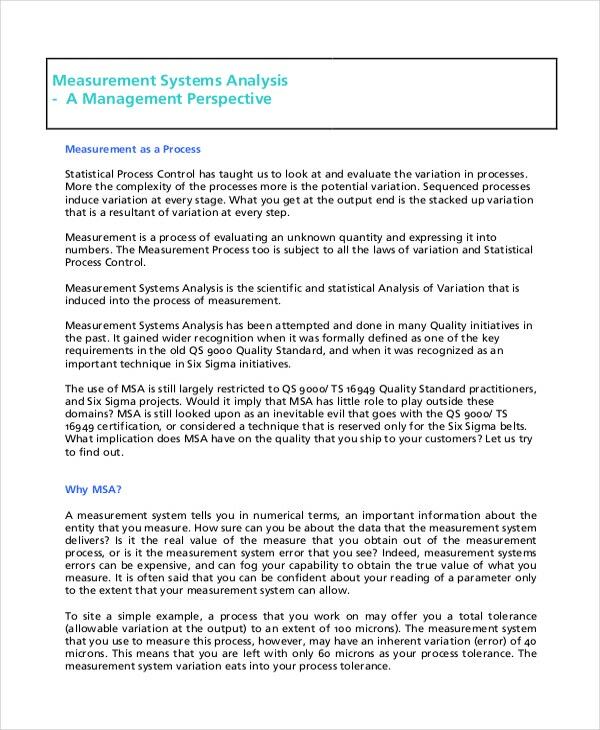 Instead of spending all your life firefighting risk management or any other processes, use this MSA Six Sigma Example to help you review the mystical analysis over time to decide on the acceptability of a measurement system. We pay a lot of money to people not to commit mistakes, which doesn’t work. Also, we are 100 times more likely to commit an error during a complex task compared to a simple task. But how to predict and prevent the risk in the first place? 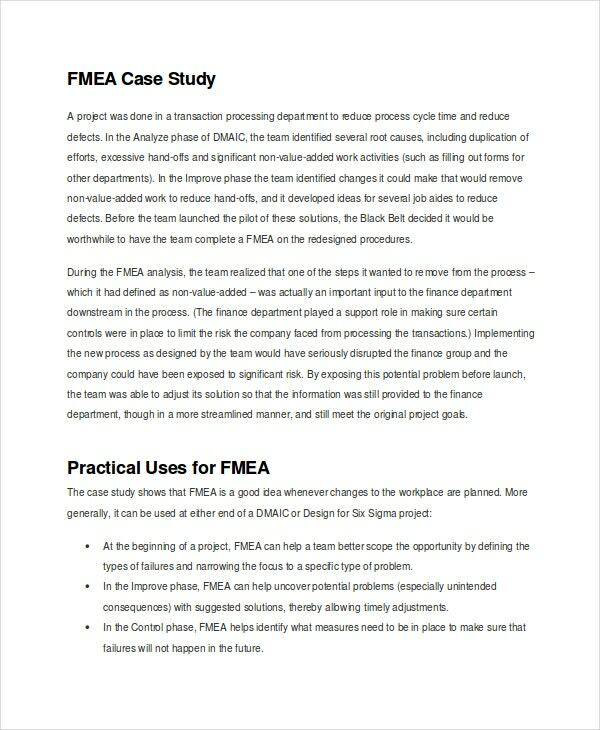 The implementation of this Failure Mode Effects Analysis Six Sigma Example is a good step that you need to put into practice, immediately after you got a hook of the project. It records the potential failure modes. Six Sigma has got many names, for instance in Japan, it is called Kaizen or 5s. If you are experiencing the process nightmares firsthand in your organization, try Six Sigma. When your organization becomes the part of Six Sigma implementation, you start gaining values. However, many people opine that the Six Sigma Sheet Template is inhumane and scrutinizes employees way more than what is reasonable. For them, it’s micromanagement that forces employees to be more efficient or accurate. Are you still using six sigma and unable to yield results? Then it’s a management issue, not Six Sigma’s. If you feel that Six Sigma is a complete waste of time for what you do, then consider it a big red flag to stay away. However, Six Sigma won’t work on its own. You need to use all your talents stashed away to infect your organization quickly and thoroughly with Six Sigma.